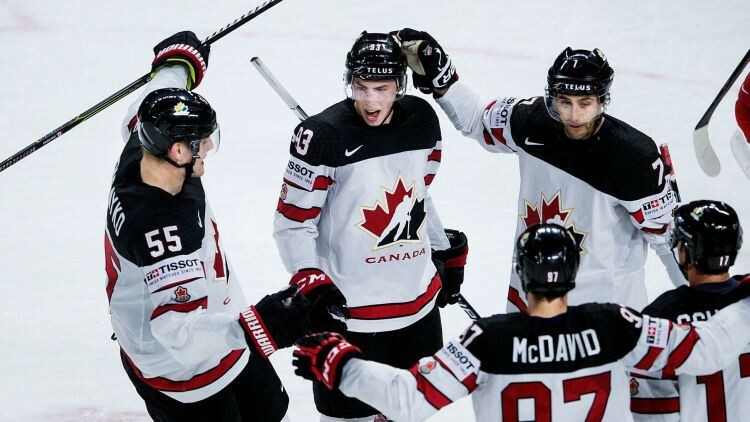 In both Russian and Canadian teams, five wins were won in the tournament, with the same number of goals scored and scored (32:10 and 32:12 respectively), but the coincidence of the circumstances also put them in the same queue in the quarter finale. The Russian team in this match decided to send their nominally second goalkeeper Ilya Shevtorkin, who had played less in the group tournament than Vasily Koshekin, but was able to stay dry and not to miss any goal in this tournament. During the first period, Canada attacked much more, but it helped do two more Russians, and the Canadians used the first one, heading in the fifth minute. Konor Makdeivid immediately left the pitch after Koltan Pareiko, who beat Shtejorkin a long shot after entering the area. However, the Russians needed only a minute to get one goal. Already throughout the tournament, Canadian goalkeeper Darcy Kemper did not show a convincing match, and this time he played an unsuccessful move to cope with the first shot, but then the avant-garde striker Ilya Mikeyev had already been thrown into almost empty gates. The Russians also did not cut off until the end of the season, when Jevgenijs Dadonovs scored the goalkeeper Barabanov with a pass. During the third period, the goalkeepers of both teams were still not at their height. Shepherd's keeper crossed the Kaila Turis mesto rig between the footmen, Kemper did not react to Zaicev's shot from a sharp angle (the Andronov was front-facing the goalkeeper), Shejjorkin replied with a dropped roller that was immediately thrown into Dibu, but in the 55th minute, Kemper did not dash Anisimov a simple shot from a sharp angle that gave Nikita Zaicev the third performance point in this game. It all kept balance in the game, with the end of the base time waiting for a draw of 4: 4.